This article discusses options for sealing basement or crawl space floors and walls, or other building foundation walls to stop water entry and to reduce interior moisture and mold risks. 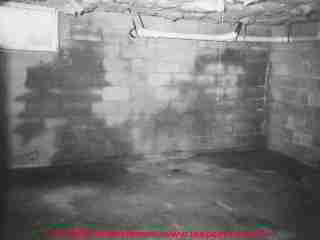 The photograph at page top shows a very wet basement foundation wall built of concrete block. The stain pattern extends high on the basement walls, down the full wall, onto the basement floor. Correcting this particular water entry problem should begin outside with roof drainage and surface runoff. This article discusses foundation wall and floor slab sealant options. .
Aaron Kuertz, Applied Technologies, Inc. Description of various basement waterproofing paints, coatings, sealants. How basement water may show up in a building attic. Basements are below grade and surrounded by soil. This soil absorbs water during rains and then releases it. The water can migrate through a block basement and even through solid concrete such as in walls and floors by capillary action. This water that enters the basement can cause problems ranging from peeling paint to mold and mildew growth. Also, naturally occurring gasses that are released from soils can be transmitted into the basement. The interior basement air quality is lessened unless the walls and floors are sealed. It is possible to seal the concrete or concrete blocks used in basement walls and floors and stop water and gas migration into a basement. In fact, it can be done from the interior of a home. Old homes and new homes alike can be sealed. As Carson Dunlop Associates' sketch shows, foundation crack leaks can be repaired from outside the foundation wall using a combination of asphalt-mopped damp proof coating and a waterproof bituminous membrane that is then adhered to the wall surface. Sodium silicate is used in a water-based mixture to seal the basement walls and floors. The sodium silicate penetrates up to 4” into the substrate. After penetrating the sodium silicate reacts with the free lime content of the concrete or masonry . Concrete, concrete block and masonry has lime as a natural component in their composition. This reaction between the sodium silicate and free lime produces a solid crystalline structure that fills the microscopic cracks and pores of the substrate. This hardens and densifies the concrete and masonry so that water vapor and gasses cannot migrate through by capillary action. Also, gasses are retarded from entering a basement. After curing, the substrate looks the same as if it were not sealed. There is no surface film or sheen to it. By sealing the basement walls and floors with sodium silicate water vapor will be stopped from entering into a basement. The basement will be dryer than before. This greatly improves the interior air quality of a home by retarding the growth of mold and mildew. Since the surface of the walls and floors are hardened, they will have less dusting and chalking. Gas transmission will be reduced as well, further improving air quality. Many people like to paint the floors and walls of their basements. If paint is applied to unsealed walls and floors, it is possible for the water vapor to get trapped under the paint. After a period of time the water vapor can break the bond between the paint and the substrate. This causes the paint to blister and peel. After application of a sodium silicate the walls and floors can be painted without fear of the paint peeling and flaking. Also, adhesives for tiles or other floor coverings can be used. Sodium silicate is applied to bare concrete, concrete block or masonry. Anything that would prevent the sodium silicate from being absorbed must be removed. No grease, dirt, soil, adhesives, oil, sealer or paint can be on the surface to be sealed prior to application. Application is done simply by using a garden sprayer, roller or brush. First dampen the surface with water using a mop or brush. Apply in areas 10’ x 10’ in several light coats. Apply each coat after 10-20 minutes. Concrete takes 2-3 coats, concrete block and masonry 3-4 coats. Do not over apply the sodium silicate since if all of the product is not absorbed it may leave a white residue. Wipe up any excess product. For several days after application loose dirt will be pushed out of the substrate. This is normal and can be swept off. Watch out: any surface coating, even a penetrating wall sealer such as discussed here, can fail if exposed to continued or chronic water and water pressure through the foundation wall. The pressure from water, frost, or more significantly, the formation of efflorescent salts (see EFFLORESCENCE SALTS & WHITE DEPOSITS) can exert tremendous pressure, sufficient to separate a paint or other coating from a masonry foundation surface. Efflorescence has been cited in several paint failure studies where these forces were explored. product, release into surface water is harmful to aquatic life. ... Dries to form glass film which can easily cut skin. Spilled material is very slippery. Can etch glass if not promptly removed. Also see this MSDS for Krystol Hydrostop WB [copy on file as /exterior/Krystol-hydrostop-wb.pdf ] - WB from Kryton Corporation. Thanks to reader Stan Rosenbaum for alerting us to the need for care when working with sodium silicate. AkroGuard is a field applied, non-cementitious, [acrylic] flexible coating that when used with AkroFill creates a water-resistive barrier over approved substrates. Basic Uses: AkroGuard is designed for use as a water-resistive barrier and air barrier over approved substrates and with the AkroFlex EIF Systems. Complies with ICC-ES Acceptance Criteria for Water-resistive Coatings (AC212). Thanks to reader J. Campbell for pointing out this product, March 2010. Krystol Hydrostop, Kryton Corporation, "Crystalline Waterproofing" masonry sealer. MSDS for Krystol Hydrostop WB [copy on file as /exterior/Krystol-hydrostop-wb.pdf ] - WB from Kryton Corporation. Masonry sealer. Krystol T1 and T2 waterproofing system is brush-applied onto concrete surfaces to become an integral part of the concrete. It contains Kryton's renowned waterproofing chemicals and is durable and self-sealing. VI-CRYL CP-10/11 weather barrier coating is unsurpassed for the mechanical protection and weatherproofing of thermal insulations both outdoors and indoors, in hot, cold, and dual-temperature service. However, since it is a ‘breathing’ coating (vapors under pressure will pass through it) it should only be used over insulations in lowtemperature, or dual-temperature service when the insulations themselves are vapor barriers. VI-CRYL CP-10/11 has also found use throughout the thermal insulation industry as a coating used over closed cell polyethylene and polyurethane foam insulations. Industry experience has demonstrated that all weather barrier coatings may blister when applied over polystyrene board. This effect may be limited by the use of white colored coatings. VI-CRYL CP-10/11 weather barrier coating in its Metallic Gray color is the ideal companion product to Aluminum and Stainless Steel Jacketing. VI-CRYL CP-10/11 gives superior mechanical and chemical protection to any irregular shape or surface where the application of Childers Metal Jacketing Systems is impractical. Reader Question: is coating my block foundation wall with tar the best approach to stop basement water entry? I really love your website. Found very good information on installing a bathroom vent that I shared with the electrician we hired to install. Thank you for what you do. I live in NE Ohio. Home built 1958 with basement and crawl space. We have lot of cracks in foundation walls (concrete block) and crawl area purportedly due to pressure from saturated soil/clay on exterior. There is efflorescence and seepage in some areas. No flooding though. I have obtained a handful of waterproofing quotes wherein each company recommend exterior waterproofing down to the footers with tar application to the exterior walls and rock backfill up to 18" below surface with topsoil layer on top. I do not see much information on your sight about this approach to drying out a basement and crawlspace. It is very expensive and I am having difficulty taking the plunge as the whole process feels like buying a used car (without the reward of a nice new car). What are your thoughts on this technique versus other means of waterproofing? Are there are other alternatives that are potentially as effective to dry out our basement and crawl area? Our downspouts go directly to our storm drains underground and have been inspected and snaked and are clear. Had our sewer and storm lines replaced about a year ago after identifying crushed clay pipes from settling of house was cause for backups of sewage during storms (they were so damaged the sewage would back up into storm drains during heavy storms). Thanks for the nice note and helpful question. I will summarize approaches to foundation waterproofing below, with the caveat that an onsite inspection by an expert - one who does not have any conflict of intererest such as making a profit from a particular solution to the problem of water entry, may well discover other important factors that we haven't mentioned here. Your description of clay soils around your home suggest that the ground won't drain well and that water spilled close to a foundation wall will much want to enter the building. That's because the excavation to build the original foundation creates a water-collecting trench around the building that generally slopes towards the foundation walls and that even backfilled with gravel and soil, will permit water to soak down along the foundation wall where, if there is not already good drainage, it wants to come inside. You can not quite see in our sketch at left that there is a hidden fly in this ointment of wet basement prevention: roof runoff water spillage that happens to fall close to the foundation wall may find an easy path down along the foundation wall even though soil seems to slope away from the house. This is why all basement de-watering jobs should start with an expert inspection of the gutters and downspouts, ideally during rainfall. The most honest basement de-watering guy I have spoken with about the omission of this roof spillage problem argued convincingly that most homeowners simply don't maintain their roof's gutter and downpout system, so his de-watering barriers are justified as providing a failsafe system for keeping the basement dry in the "real world" of what people do (or don't do) rather than my idealized world of what we should do. We discuss exterior (and other methods) coatings for foundation walls in the article above and at at WATER BARRIERS, EXTERIOR BUILDING and FOUNDATION WATERPROOFING and also GEOTEXTILES & DRAINAGE MATS. Dampproofing coatings stop the movement of moisture through a block foundation wall due to capillary action - the pull of water molecules from the damp outside of a foundation wall towards the (usually) more dry interior wall surface. But a dampproofing coating like tar or bituminous asphaltic compounds do not reliably seal cracks and other large openings. Even if you did blob on enough tar to seal such an opening, the tar coating is not flexible enough to keep that opening closed over time and across the effects of temperature variations. Iinstallation of one or more layers of geotextiles ( GEOTEXTILES & DRAINAGE MATS.) or similar waterproof barriers against the foundation wall. Such fabrics or plastic barriers combine an absolutely waterproof surface with some means of providing a channel to drain water against the foundation down to the footing drains where it finds an easier path away from the building than into it. Carson Dunlop Associates' sketch (left) and our photos (below) illustrate, proper installation of a combination of damp proofing, a drainage mat, and a geotextile to keep the drainage mat from becoming clogged by soil particles can be effective in keeping roof spillage and surface runoff from penetrating the building foundation walls. Watch out: even this approach won't prevent basement or crawl space water entry if groundwater levels are so saturated that they are rising up beneath the basement floor slab. In the case of a building whose roof runoff is absolutely properly handled already (more often it is not), and where there is not surface runoff towards the building, but where wet soils and groundwater still are causing water entry problems, we might opt for the exterior foundation waterproofing method I describe above. However this approach is very costly because it involves exterior excavation and also because it often disturbs existing plantings, walks, drives, etc. Therefore I'd be more likely to recommend this approach for new construction in problem soil areas than for an existing structure. Even though it is always technically preferable to stop water outside of the foundation rather than allowing it to enter and then get rid of it, many homeowners find that an interior plastic barrier against the foundation wall and draining down to an interior trench and drain system is so much less costly that they consider this alternative. Where would I shift thinking back to an outdoor approach for an older home? Perhaps where the cost of an interior basement waterproofing system is increased by the need to tear down some kind of expensive interior finish work. Or where for other reasons we already are employing a backhoe at a site. Finally, field experience argues that one should take a very careful look at the roof drainage and surface runoff control topics before launching a costly interior or exterior basement waterproofing installation job. For example, at many building inspections made in response to a wet basement problem for which owners told me that they had already corrected roof gutter problems I would find that the roof drainage system was not working as people thought - spilling, or leaking where people didn't realise it. For a novice who won't recognize all of the clues found by an expert, it will be helpful to make a careful inspection of the building exterior during a time of heavy rainfall. Often you'll find a surprise. Continue reading at WET BASEMENT PREVENTION or select a topic from closely-related articles below, or see our complete INDEX to RELATED ARTICLES below. Or see FLOOD DAMAGE ASSESSMENT, SAFETY & CLEANUP where we include additional photos of basement water entry. BASEMENT WATERPROOFING at InspectApedia.com - online encyclopedia of building & environmental inspection, testing, diagnosis, repair, & problem prevention advice. Before sealing a basement leak, it's important to identify the water source - else the leak will continue or will reappear nearby. Find and fix the cause. With that step taken, depending on the leak point and building surfaces involved (which you haven't yet described) we can recommend some solutions. The choice of best sealant or coating depends in part on what kind of surface is to be sealed and second the nature of the moisture, dampness, or water entry trouble.